It's a Hawthorne, I bought it used, and the owner didn't know how old it was. Or at least what decade it's from. Any ideas? Please provide additional data, including style/type of bike and list of components. If it is not a "10-speed" road bike, you should probably try another discussion area. Good luck in your quest. Sorry, I just noticed your (reversed, by the way :) ) photo. Please post in the balloon / middleweight discussion area. Hi all, I just bought some old Huret Wingnuts to replace the nuts on the back axle of my singlespeed peugeot beater. After getting them (ebay) I got to wondering is this a safe idea? Any opinions? For a single speed, yes. Not to be used on a bike with chrome drop outs or chrome ends! Tighten securely. With chrome ends if you get up and sprint riding off of the seat and you crank down you can pull the wheel to one side and really get hurt. I did this on my Lenton and learned from experience. In the 1960s, wingnuts were very common on low-end road bikes; my 1962 Bianchi came with a full set. As Chris noted, a strong rider may have trouble keeping the right rear nut tight enough to resist chain torque, which is why some folks substituted a regular nut in at least that position, if not both sides of the rear axle. I put a set on my single speed Hercules - I like the old look it gives. They have held pretty securely. However, I haven't really hammered down on the pedals all that much - but with the dropouts not being chrome - it gives plenty of friction between the nut and the dropout. I can see where a chrome dropout would not allow a secure-enough hold. Got a libertas mixed frame sandwiched between to huffies. I decided to spend the five bucks to rescue it. The frame is very light, has no 531 stickers that I can find, came with simplex deraileurs and steel cotterred cranks which says to me: Kinda cheap. I'm curious about the company libertas and would like to hear opinions about putting effort into making it a single speed for a light riding friend of mine. Great story! Although the hard-core collectors go after high-value bikes only, lots of the rest of us have rebuilt bikes of all types, sizes, and quality levels. 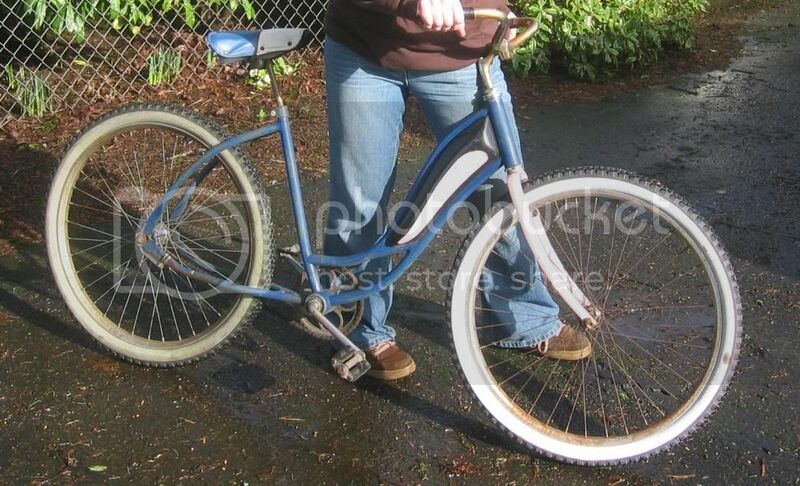 When my son was younger - I managed to find him a 20" Gitane racing bike with 3-speed derailler. He rode it 'till he outgrew it - now he has a 24" Lotus 10-speed that I also managed to luck up and find. My son wants to keep his 20" to give his son (My son is 11 now). Hey, if I spotted one of these old 20" racing-style bikes, or even a 24" - I'd get it for collecting - you just don't see very many of them. Specialized makes a nice miniature racer. It uses just about the same componantry as the regular one, so its nearly as pricey. About $900 if I remember. I almost bought this junior race bike for my daughter on ebay, it is local to me and I could pick it up. Instead I found her a 48cm trek which is too big but she can just ride it, she's 11. Anyway, this bike sold for the $200 reserve and I guess the buyer backed out because it's back on the block again. I don't know the brand, but it seems pretty cool to me. Sorry, I cannot view your photo, but get: "The page you are requesting cannot be found." This discussion also takes me back to my days at Bikecology (early 1970s), where we sold a few "Baby Olys," i.e., small-framed Nishiki Olympic 10-speeds with 24x1-3/8" wheels. I've noticed that these small bikes often have very outsized cranks; the pedal would travel halfway to the saddle, e.g. There was a very nice Cuevas on Ebay a few months ago; built for some kid's cross-country record attempt. Very beautiful small bike w/all the best components. I'm not sure it even got a bid. I think people are reluctant to tear up such a gem for parts, but they don't want it for itself, either. That indeed looks VERY sharp, but I concur with David that the cranks might be a bit longer than optimal for anyone who can just stand over the frame. they are gold, sears robuck sticker, thinking about 1970 from pics i have seen, have carriers on front and back, a gear shift. can take pic i guess if needed. Your description tells us nothing. You're in the wrong forum (this one is for old "10-speed" type bikes). And, whatever you paid for these bikes, you will have difficulty finding another person to pay you the same amount. Welcome to the forum, Wendy. If these are "10-speed" bikes with derailleur gears, you are in the right place. If they have internal gears (e.g. the familiar 3-speed rear hub), there is another forum thread that may be a better fit for you. What usually helps us is identify or appraise a bike is one or more medium- or high-resolution photos of the right/drive side and/or a list of components. At one time, Sears marketed some decent entry-level road bikes and 3-speeds made by Steyr-Daimler-Puch of Graz, Austria. However, by the 1970s they were selling mostly extremely heavy, American-made (Huffy? Murray?) bikes instead. John E has a lot of class! I agree! John E. is a treasure within this forum. Thank you for the vote of confidence, Bryan and Richard. Whether cycling on a road or trail or posting to a discussion group, I simply try to be a diplomatic ambassador for all aspects of bicycling, including transportation, recreation, fitness, and restoration. I want to share my passion for my favorite sport, and I think all of us benefit when others become interested in bicycles and bicycling.